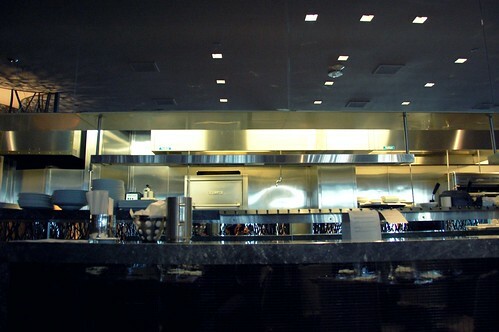 Los Angeles is one of those rare cities that actually has good hotel restaurants. 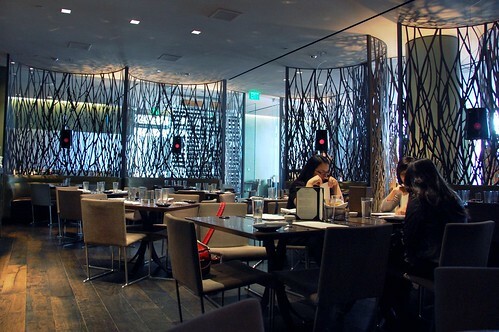 Simon LA, the brainchild of culinary star Chef Kerry Simon, may be at the Sofitel, but it's worth visiting even if you're not staying at the hotel, especially during dineLA, when a three-course lunch costs $22. 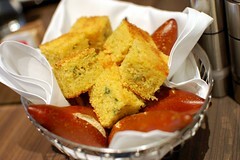 Complimentary jalapeño cornbread and pretzel bread. 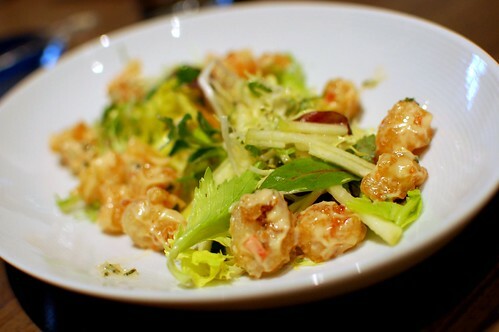 Wan and Nanette started with the creamy crispy rock shrimp Fuji apple salad. My friends are wonderful and always let me have a bite. 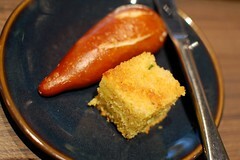 Quite lovely and precisely what the dish promises -- crispy and creamy. I liked the pairing with the crunchy sweet apples. 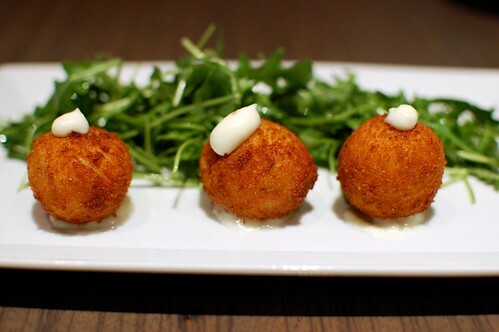 Winnie got the short rib arancine with wild rocket and garlic aioli. I declared these Golden Balls of Yum. Winning starter, hands down. I chose the kabocha squash soup with toasted oats and spiced cranberries. 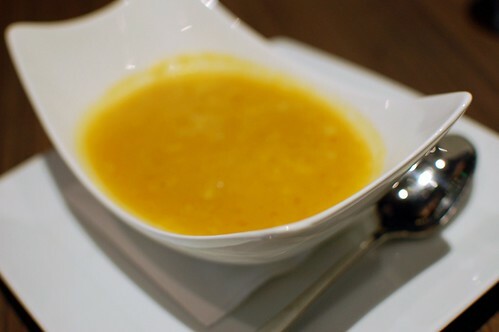 Excellent soup -- a little sweet and filled with atypical texture. 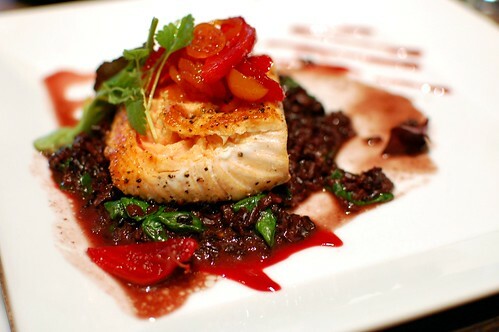 Nanette and Winnie noshed on pan-roasted salmon with forbidden rice, a beet trio, and a blood orange reduction. My bite was unmemorable. Not bad. Just not amazing. I did like the forbidden rice, though. That was more interesting than the salmon itself. 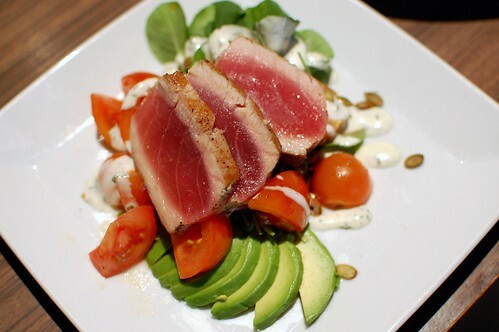 Wan enjoyed her seared ahi green goddess salad. Cool and fresh, but, again, nothing mind-blowing. I got the Iron Chef burger -- yes, this trio helped him win on Iron Chef America. Winning main course! Well, I thought so anyway. Yay for me! 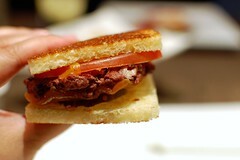 A tiny juicy burger with cheddar and tomato on perfectly cut and toasted brioche? Truffle oil French fries? 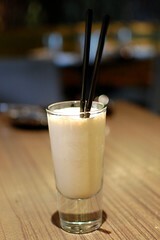 An adorable mini vanilla milkshake? How could this be anything but awesome? Totally won me over. 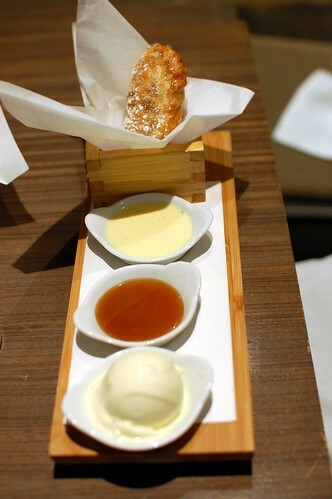 Nanette and Winnie tried the apple turnover dessert with dipping sauces and ice cream. Fabulous. Golden and warm and oomphed up with caramel and vanilla. Wan opted for Kerry's cheesecake. Decent but not particularly rich or mmm-inducing. 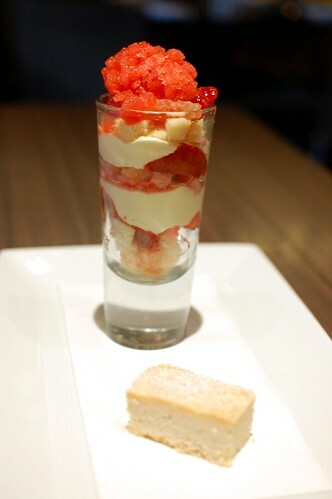 I went crazy for my citrus parfait and shortcake cookie. I love parfait, so I'm biased. If I weren't biased, I'd declare the turnovers the winning dessert. That was not the end. 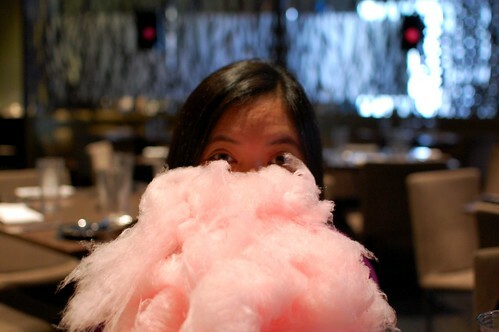 No meal at Simon LA is complete without free giant cotton candy! For size comparison, note the Splenda packet. For fun, laugh at the sunglasses. i thought that pretzel bread in the photo on the right was some raw tuna cut very oddly at first glance. never mind. 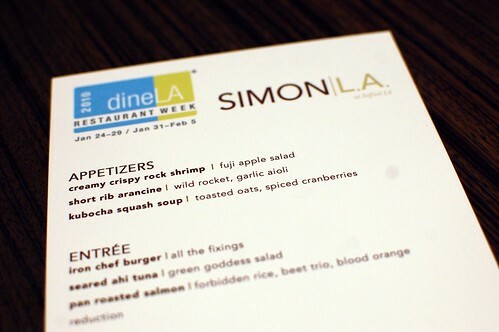 yay for dineLA! 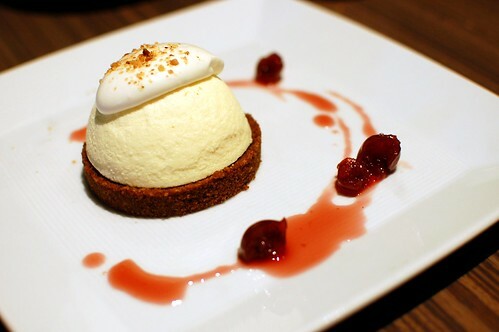 the SF ones were 2 courses for $18, so we ended up skipping the lunch reservation we made. Everything looks great! My favorite are those arancie balls and the milkshake. That is some crazy fun happening at Simon (including cotton candy man celebrity sighting). Enjoyed that meal. Great food and great company! 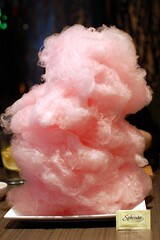 I love that the meal ended with cotton candy :) I love cotton candy! 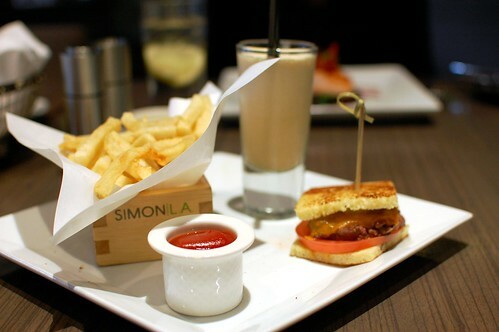 The Iron Chef burger trio looks cute but the burger also looks a little small? YUM...that rock shrimp salad and the apps and the cheeseburger trio are calling my name!! man, that was good stuff. the teen still laughs at the memory of "golden balls of yum!" Yum, I love that restaurant! After a lunch that big I'd be sleeping at my desk. Between the tofu from Starry Kitchen and that pic of the arancini, I must admit that I'm obsessed with balls. That looks like a great DineLA meal. I'll keep it in mind for next time. Wow, everything looked really good. I didn't even know LA had a Sofitel. Love the balls and jealousE of the cotton candy. 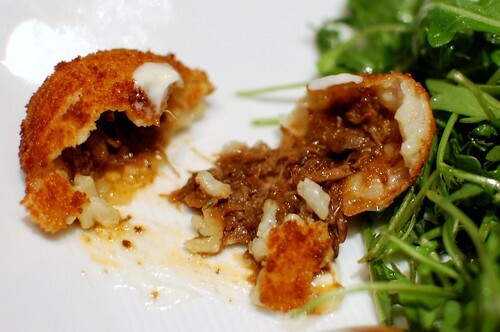 Those short rib arancini looked fabulous. 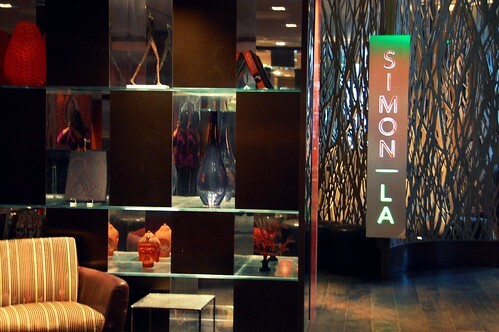 I actually went to Simon LA for dineLA a couple of years ago & really enjoyed my meal and have been meaning to go back. I love the term "golden balls of yum." Fantastic looking meal! I too would have gone with the Iron Chef Burger! 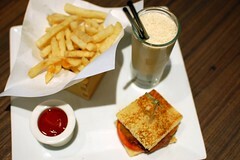 that burger/fries/milkshake course looks to.die.for! and I'm snickering at that last photo, too funny! YUM! 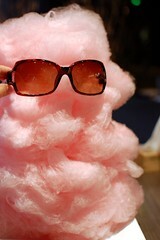 Love all the photos...especially the GIANT cotton candy pics. So much lovely memories! Love this review.